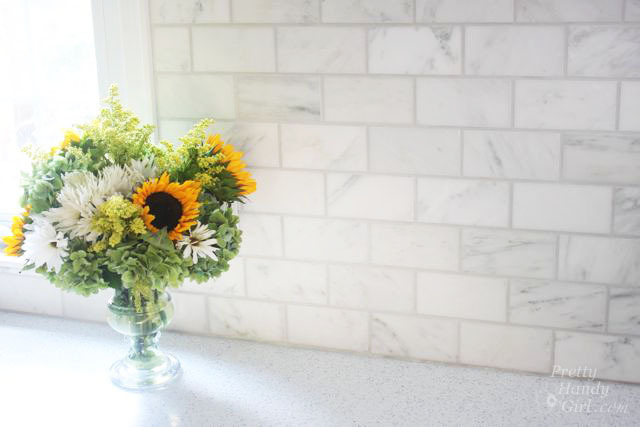 How did you do yesterday with the How to Tile a Backsplash: Tile Setting tutorial? Not too bad, right? Well, today will be a very gratifying day. Today I’m going to show you how to grout (and seal) your tiles and finish off your kitchen backsplash. You are going to love the end result. Prep work: If you are working with a natural stone tile, you may want to seal the tiles before grouting. I sprayed StainGuard5000 on a dry clean rag and wiped it onto all the tiles. Then buffed it off after five minutes. If you are using a rapid setting grout, you might want to slow the “setting” process slightly. I learned this trick from our local tile shop: Start by filling one bucket with ice water. Nest the second bucket inside the first. Mix your grout according the package directions. Mix as much as you can spread in about 15-20 minutes. If you want to save yourself the extra step of sealing your grout later, you should use Grout Once (or another sealer additive) instead of water when mixing your grout. Mix until you have a thick consistency, like smooth peanut butter. Use the spatula to load the grout float with grout. Spread the grout onto the tile by dragging the float across the tile at a 45 degree angle and along the wall at an angle. Then drag the float in the opposite direction (imagine creating an “X” on the wall. Push firmly to force the grout into the spaces between tiles. Scrape off excess grout from the float and use it to squeegee off any excess grout from the tiles. As the grout starts to firm, sponge off your tiles with a very damp sponge. Remove any excess grout from the tiles by frequently flipping the sponge to a clean side and rinsing the sponge in water. Follow this tutorial to learn how to caulk with a caulking gun. To get a smooth caulk line, I like to use my finger dipped in ice water. I follow up with a baby wipe on my finger to smooth and get rid of excess caulk. Before the caulk dries, remove any painter’s tape (put up before you tiled) to reveal a clean line. That’s it! Enjoy your newly finished kitchen backsplash! I am in LOVE with our backsplash. I was talking to my friend and told her that it was amazing how much more “finished” the kitchen feels now that the backsplash is done. The tiles I used are Venato Marble 3″ x 6″ honed subway tiles from TheBuilderDepot.com. If you are looking for a good source for tiles, check out TheBuilderDepot.com. Their prices are fantastic! Plus, you can use this coupon code to save even more money! Now, I hope you’ll excuse me as I enjoy my new view while cooking. I will put together a tutorial later on how I built the tiled niche above the stove. Feel free to leave me questions if you have any about tiling and grouting. This is definitely a task any DIYer can accomplish! 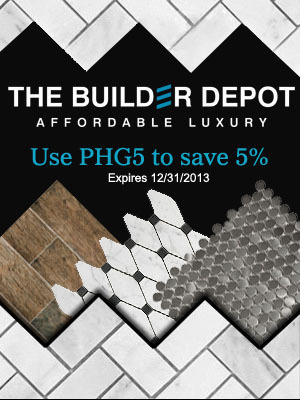 Disclosure: I was provided with complimentary tiles from TheBuilderDepot in exchange for mentioning them in this post. As with all the companies I mention, I have thoroughly researched the company and I share these resources with you because I believe in the quality of their products at an affordable price. I was not told what to say or write. All words and ideas are my own. What color white paint did u use? Love the tile work you did! Fantastic! I have a quick question. Do I need to grout the tile where the tile meets at the cabinets, window trim, and the ceiling? We just did a tile project and we carried the tile up to the ceiling. I have heard conflicting advice online about using caulk or grout. Thank you in advance! You should caulk anytime your tile meets a surface on a different plane. For example where the tile meets the ceiling (or crown moulding.) And where the tile meets the countertop. These areas need to be able to flex. Grout should just go between tiles. Be sure to check to see if you can buy caulk the same color as your grout. Thank you so much!!! I was getting so confused on my research! ? Your tutorials are some of the best out there. I am in the process of doing a marble backsplash in the kitchen and just finished the tiling, and will grout tomorrow. Thanks for your great instructions and videos; I’ve referred back them many times! Question? Have been grouting backsplash and getting tired. Can I rest and add more grout later? I know the grout will have dried and hardened. 75 and tuckered. (pt2 how to ). Yes, you should be able to stop and come back to the grouting another day. Just make sure you finish the area you start by wiping off the grout on the tiles and buff off the haze or it will be difficult to clean later. You had mentioned doing a tutorial on your tile niche above the stove. I have not been able to find it. Can you point me in the right direction? Beautiful kitchen. So looking forward to begin working on mine. I love your backsplash. I did a lot of research and purchased the same tile you did from the same vendor. In your video, it sounded like you said you used 1/4 inch spacers. Is that correct? I know it’s a matter of personal preference but I’m trying to decide. Our installer was planning to go really thin (maybe 1/16th) but I want larger. Did you use 1/4? After a few years have passed, are you happy with 1/4? The pictures look beautiful. Brittany you always knock it out of the park. I love it! Beautiful job, well done. I have a question, did you ever do a tutorial on hoe to pull electrical outlet so they will become flushed with the new wall tile? Love this! Where did you get the tile for the niche? It is gorgeous.